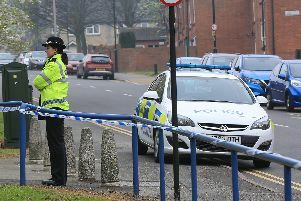 A shooting in Sheffield which left one man dead and another seriously injured is being treated as a ‘targeted’ attack. Councillor Harry Harpham, Sheffield Council’s Cabinet Member for Homes and Neighbourhoods, spoke out to reassure residents after two 22-year-old Sheffield men were gunned down as they travelled along Derek Dooley Way, towards The Parkway, last night. Police said a gun was fired at a car - killing the passenger and injuring the driver. Both men were taken to hospital by ambulance but the passenger could not be revived. The driver of the car remains in hospital in a stable condition. Coun Harpham said: “We have been assured by the police that this was a targeted incident and they have no reason to suspect that any general member of the public is any more at risk because of this incident. “It is really tragic - any loss of life is really tragic. Officers are standing guard at the crime scene at the junction of Derek Dooley Way and The Parkway as inquiries into the double shooting continue. The armed killer who struck at 10.15pm last night remains at large. Sheffield Hallam MP and Deputy Prime Minister Nick Clegg has urged anyone with information about the shooting to come forward. VIDEO: Sheffield man shot dead a ‘tragedy’ says Nick Clegg - CLICK HERE. Sheffield streets ‘not full of guns’, say police - CLICK HERE. He described a recent firearms amnesty as an example of the work being carried out in South Yorkshire to rid the streets of guns. “The firearms amnesty was a national initiative and part of a long-term strategy to tackle gun crime,” he said. “Officers carry out immediate and prompt action wherever possible to locate and confiscate firearms. “Aside from that, we also carry out a significant amount of long-term work around educating young people in the county about the dangers of firearms and the consequences. We are also committed to working with our partner agencies to try and stop the flow of weapons. Workers for Capita, whose offices are based close to the scene of the double shooting, expressed their shock at the killing as they arrived at work this morning.